Training proposal: based on the user’s high-level goals (i.e. lose fat, improve cardiovascular system, etc. ), TripleBeat chooses the appropriated training zone to help achieving these goals with health. Competition on a game basis: users can virtually compete with their past performances or even with partners. The goal is to follow the proposed workout as close as possible to guarantee the desired results with health. Audio feedback: songs on the smartphone digital library are searched and TripleBeat selects/plays the one with specific features that might encourage the user to speed up, slow down or keep the pace to be on track with the exercise goals. - full summary by the end of the workout. 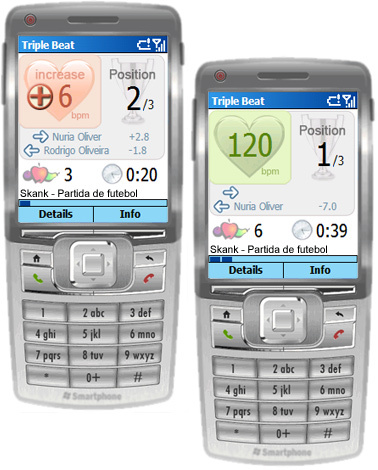 MPTrain: A Mobile Music and Physiology Based Personal Trainer by Nuria Oliver and Fernando Flores-Mangas. In Proc. of MobileHCI 2006 conference, Helsinki, Finland, Sept 2006 (pdf). PAPA: Physiology and Purpose-Aware Automatic Playlist Generation by Nuria Oliver and Lucas Kreger-Stickles. In Proc. of ISMIR 2006,Victoria, Canada, Oct 2006 (pdf). Enhancing Exercise Performance through Real-time Physiological Monitoring and Music: A User Study by Nuria Oliver and Lucas Kreger-Stickles. In Proc. of Pervasive Health 2006 conference. Innsbruck, Austria. Nov 2006 (pdf). TripleBeat’s hardware: AliveTec chestband (optional stickers) with ECG, accelerometer and Bluetooth sensors; The smartphone receives data from the chestband and TripleBeat does the magic.